Having showcased the best shorts from Britain, Europe and America, the Cinema16 team are taking on the world in their latest two-disc collection. It’s no easy task to encompass the entirety of world cinema in 16 short films and, as is to be expected, there are significant gaps. Sadly, there are no works from the Middle East or Eastern Europe, and African cinema is represented by just one film, Borom sarret (1963). Considered to be Africa’s first contribution to modern film, Ousmane Sembene’s portrait of a Senegalese cart driver is incongruously older than the other films in the collection (most of which date from the 1980s onwards). As such, despite its beauty and importance, it highlights a need for more modern examples of African filmmaking. Geographical bias aside, the DVDs present a wonderfully eclectic snapshot of contemporary world cinema. The animations are particularly strong. Sylvain Chomet’s The Old Lady and the Pigeons (1998) contains the same winning combination of absurdity and slapstick which made his 2003 feature, Belleville Rendez-Vous, such a pleasure to watch. 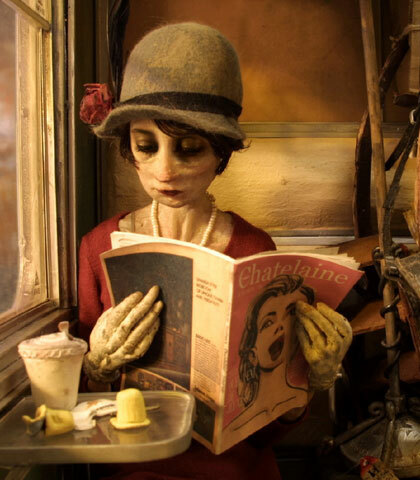 With a similar nod to silent classics, the stop-motion animation Madame Tutli-Putli (2007) is a magical work of art. Having taken four years to complete, the 17-minute short introduces the extraordinary technique of superimposing live action human eyes onto animated puppets. The added human dimension results in an intensified sense of fear as we follow Madame Tutli-Putli on her increasingly sinister train journey. This emotional depth is surpassed, however, by Adam Elliot’s poignant work, Uncle (1996). Elliot’s endearingly naive models and his tender focus on the little details of life emphasise the vulnerability of human experience. The ‘little things that happen underground or indoors’ is also the inspiration behind Guillermo del Toro’s DoÃ±a Lupe (1983-84). Made when del Toro was just 19 years old, this rarely seen film follows two corrupt, drug-dealing police officers as they try to outwit an elderly widow. The resulting dialogue is far funnier than the disappointing comedy of the collection – cult splatter film Forklift Driver Klaus (2000). Other acclaimed directors who make it into Cinema16’s selection are Guy Maddin and Park Chan-wook, who both provide visually arresting works. Maddin films Isabella Rossellini’s ode to her father Roberto – My Dad is 100 Years Old (2005) – with characteristically dreamlike beauty whilst Chan-wook’s Kafkaesque Simpan (1999) has a powerful, stylised quality also apparent in Andrew Okpeaha MacLean’s Sergio Leone-inspired Sikumi (2007) and Naoto Yamakawa’s terrifically witty Attack on a Bakery (1982). Many of the live-action contributions focus on the idea of coming of age, with two examples from the UK – Simon Ellis’s gritty tale of masculinity, Soft (2006), and Andrea Arnold’s well-acted but slightly contrived Wasp (2003) – and two from New Zealand: the recent film Two Cars, One Night (2003), and Jane Campion’s haunting A Girl’s Own Story (1984). Despite being best known for her award-winning features, Campion has said before that she believes the short film format forces filmmakers to be more creative as plot is less important. In keeping with Campion’s comments, the films in this collection, although slightly patchy both in quality and geographical range, all reveal a willingness to experiment that should inspire and entertain any cinephile.